Be aware of machinery and vehicles in operation in and around the auction site. Do not attempt to operate any machinery unless you are qualified/certified or competent to do so. Only auction employees may start vehicle engines or lift vehicle bonnets. If you operate any machinery/vehicle you do so at your own risk, and are responsible for any damage that occurs. Machines/vehicles MUST NOT be left running or left unattended at any time – please ensure the removal of keys from machines before you leave them. Children are not permitted on site. Any animals or pets must be restrained appropriately by a lead or other suitable restraint at all times whilst in attendance at Auction. Any persons under the influence of alcohol or drugs will be forbidden entry to site. Observe all NO SMOKING signs at all times. Smoking in designated areas only. Please report and Health and Safety concerns including oils and fuel spillages immediately to a member of staff. Customers arranging delivery and collection of vehicles (including plant, machinery and HGVs) to any of our sites must ensure that the transporter used is suitable for the vehicles in order to ensure safe loading and unloading. Where unsuitable transporters are supplied, Morris Leslie Plant Ltd reserves the right to refuse permission to carry out loading or unloading. Please also ensure that the staff or contractors supplied to load or unload vehicles are trained and competent to do so and are supplied with suitable high visibility clothing. Vehicles that are non-runners will only be loaded/unloaded according to Morris Leslie Plant Ltd safe procedures. It is essential that customers supplying vehicles for a sale notify Morris Leslie Ltd of any conditions that may affect the safe movement of these vehicles e.g. non-runners. No unauthorised loading or unloading is permitted. Please adhere to the maximum speed limit of 5 miles per hour throughout all areas of the site and be aware of pedestrians at all times. Please ensure that all drivers have a copy of public liability insurance. The above measures are to help ensure the health, safety and welfare of all staff, customers, visitors and others on our sites in accordance with our company Health and Safety Policy and in compliance with Health and Safety law. 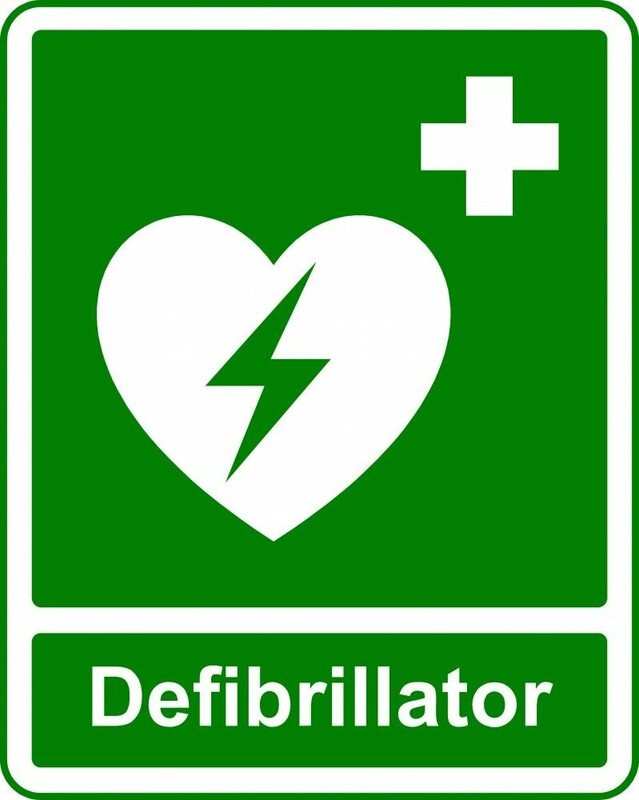 Morris Leslie are pleased to have on-site a life saving defibrillator, located to the right of the on-site café under the canopy between the halls. When turned on, the AED will instruct the users to connect the pads to a patient’s bare chest. The pads enable the AED to examine the patient’s heart and determine if the patient is in a viable, shockable rhythm. If the device determines that a shock is required, it will charge up in preparation to deliver a shock. The AED is very safe as it will only deliver a charge when it determines a shockable rhythm is present. For more information click here. When charged, the device instructs the user to ensure no-one is touching the victim and then to press a button to deliver the shock. In the case of a fully automatic AED the unit will advise the user that it will deliver the shock without further intervention. After the shock is delivered, the device will instruct the user to commence/continue CPR (Cardio Pulmonary Resuscitation) for a period, after which it will analyse the patient’s heart rhythm once again, advising whether a further shock or more CPR is needed. An AED has an internal memory, which stores the ECG of the patient along with details of the time the unit was activated and the number and strength of any shocks delivered. All this memorised data can be either downloaded to a computer or printed out, so that it can be analysed by appropriate medical personnel.